This Munchkin Panic review is based on a total of six games played. Designed by Anne-Marie De Witt and published by Fireside Games, Munchkin Panic is a semi-cooperative tower defense game that blends Castle Panic with Munchkin. Your goal is to slay every monster that comes your way… and collect as many monster trophies as you can! 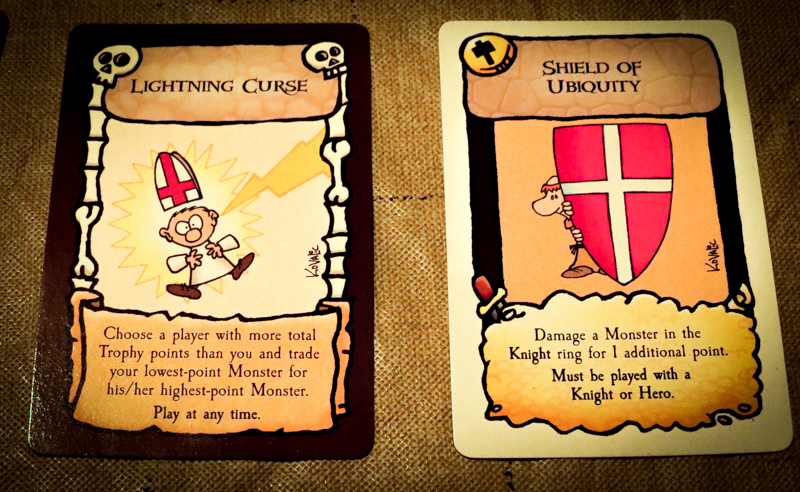 There are two types of cards that you’ll be playing with in Munchkin Panic: Castle cards and Treasure cards. Once you understand how these cards work, you should have no problem jumping into a game. Castle cards come in three flavors: Hit cards, Curses, and Specials. Hit cards each do one point of damage on a specific area of the board. Curses are the “take that” cards in the game that negatively affect the other players. Specials are the most powerful Castle cards since they often allow you to instantly slay a monster or stop them from advancing. Treasure cards come in the form of Weapons, Potions, and Specials. Weapons are used with Hit cards to make them more powerful. Potions are similar to Weapons but can be used with or without Hits cards. Special Treasure cards can give you a bunch of different special abilities, such as drawing more cards or getting some free monster trophies. During your turn, you’ll be able to attack monsters, get help from others through negotiations, or even mess with the other players a bit. When you slay monsters on your turn, you can collect them as trophies, getting trophy points based on how many hit points the monsters have. Monsters also give you Treasure cards, which you’ll add to your hand at the end of your turn. You can offer other players trophies or the treasure gained from those trophies if they help you out on your turn. 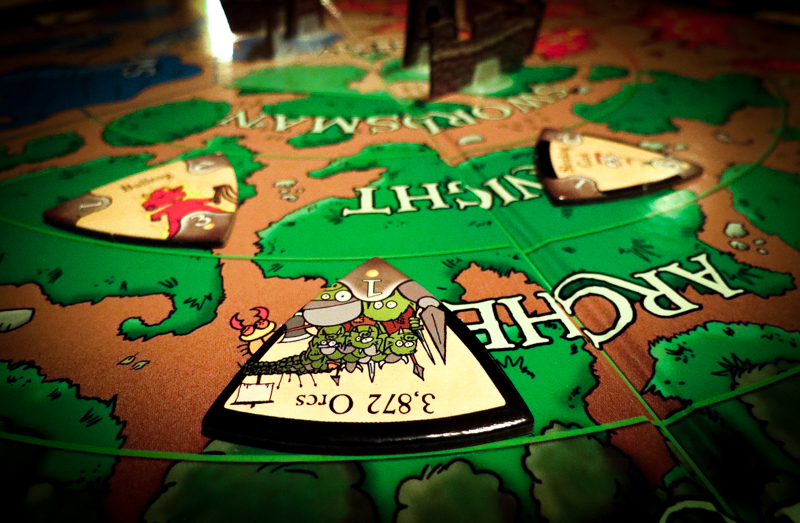 After your turn is over, the monsters on the board will move towards the castle. Then new monsters will be added to the board. If you’re able to slay all of the monsters before they take down your castle, everyone wins! The player who ends up with the most monster trophy points is the individual winner (aka The Master Munchkin). The More Munchkin Mini-Expansion is also included in the box and is our favorite way to play this game. It adds in Character cards, which give each player a special ability, and a few cards to add to each deck. The game plays pretty much the same way, but you don’t have to worry about the castle being taken down. You just want to have the most trophy points! That’s right, we actually enjoy this game more when there’s less cooperation. That’s just a general overview of how the games plays. If you want to learn more about the rules and the individual cards, take a look at the official Munchkin Panic rulebook (PDF). Anne-Marie De Witt did a great job of blending Castle Panic and Munchkin. You get the cool characters and backstabbing from Munchkin, and the tower defense/co-op elements from Castle Panic. It’s also really cool that there are a bunch of variants to choose from in the rulebook. You can add in the mini expansion (recommended! ), or you can tweak the rules a bit by using one or more of the variants. You can even play it solo or full co-op if you want to. It’s great that every monster that comes out of the bag has different artwork. This is one area where Munchkin Panic is better than the original Castle Panic. Plus, some of the characters’ names are hilarious. The negotiation mechanism works really well when playing with three or more players. It adds in an extra bit of strategy and it’s fun trying to get people to give you monster trophies and/or treasures just so they can use your cards. If you’re playing with extremely competitive players, you could run into the issue where they realize they won’t win the individual battle and will stop trying to help the team. This is only a problem in the standard mode, though, since that won’t help them when playing with the mini expansion. I’m not 100% sure about this, but I think it’s sometimes impossible to beat this game, especially when using the standard rules in a two-player game. In one game we lost, we checked to see if there was anything we could have done to avoid defeat and couldn’t find anything. For that reason, we find that the two-player game is much better when playing full co-op or when using the mini expansion. 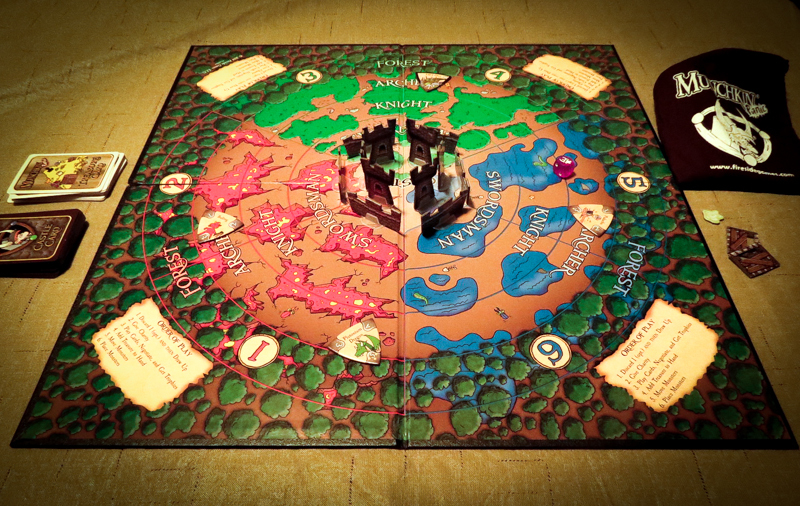 The board is a bit too similar to the Castle Panic board. We liked that they made distinctive changes to the Dead Panic and Star Trek Panic boards, so it’s surprising that this one is so similar to the original. 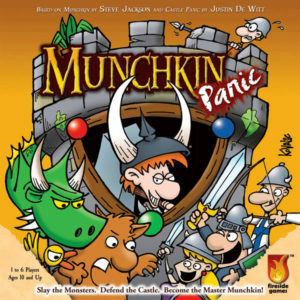 If you’re a fan of Munchkin and Castle Panic, it just makes sense to give Munchkin Panic a shot. We definitely like this theme a bit more than the theme used in Castle Panic, but we still prefer playing full co-op Castle Panic over this one (especially when we use the CP expansions). This is our least favorite of all of the Panic games, but it’s still a good family game and I wouldn’t be surprised if some people like it more than the Castle Panic base game. If you enjoy playing semi-cooperative games, then you might like this one because it’s quite a bit different than the other semi co-ops out there. It’s also a good pick if you want a semi-cooperative game that can be played with up to six players. If you do get it, we recommend using the mini expansion as soon as you’re comfortable with the standard rules. Thanks for taking the time to read our Munchkin Panic review! And thank you to Fireside Games for providing us with a copy of this game.